Legislative Counsel Peter Griffin explaining H.911 to members of the conference committee. 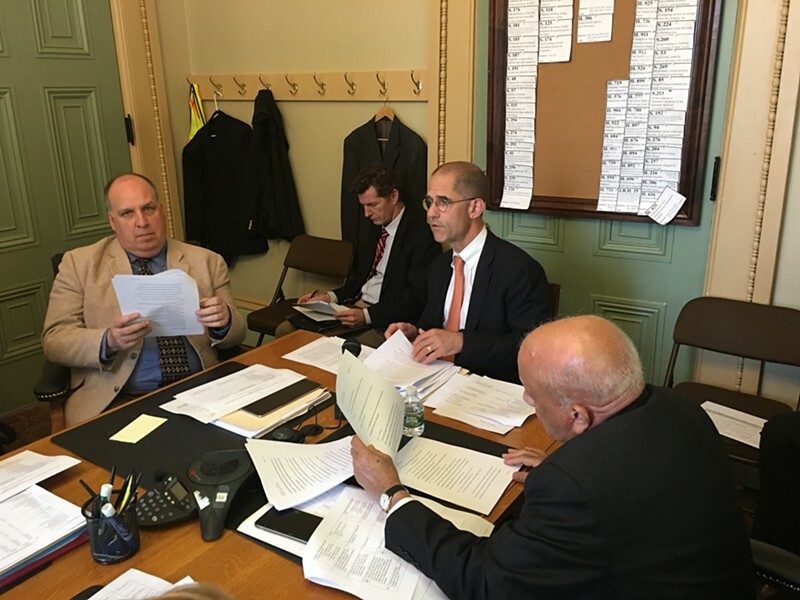 A conference committee of the Vermont House and Senate has unanimously approved H.911, a tax bill that makes significant changes in how public schools are funded in the state. The late Friday vote clears the way for the legislature to adjourn as soon as Saturday. Most important politically, the bill increases the residential property tax rate by 2.6 cents — far below earlier projections, which were in the seven-cent range, but still exceeding Gov. 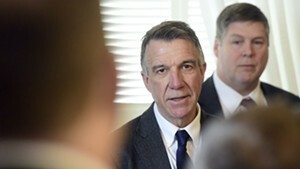 Phil Scott's demand that there be no hike in the property tax rate. All six conferees, including two Republicans, Sen. Randy Brock (R-Franklin) and Rep. Scott Beck (R-St. Johnsbury), signed the committee report early Friday evening. There had been major differences between the House and Senate on H.911, but the conference committee achieved common ground after a long day of meetings. "There's some good stuff in the bill," Beck said. "It's an improvement over where we were before. It needs to be further improved." Neither House nor Senate seriously considered Scott's plan to spent $58 million in one-time money to keep rates level. Scott has threatened to veto any rate increase, but his resolve will be tested by the committee's work in reducing the hike. As Brock noted, the increase is roughly equivalent to growth in school budgets around the state, virtually all of which were approved by voters on Town Meeting Day. The committee's report adopted portions of both House and Senate bills. The House gained a clearer delineation between education and non-education spending, and between the Education Fund and the General Fund. The compromise would end the current practice of transferring money from General to Education. Instead, the Ed Fund would get all receipts from the state sales tax, and 25 percent of the revenue from the rooms and meals tax. Several expenses outside the K-12 system that are currently charged to the Ed Fund would be shifted to the General Fund, including adult education and the Community High School of Vermont. Senate conferees managed to nix the House's proposal of an income tax surcharge for education. There are slight reductions in income tax rates, designed to offset unintended consequences of the federal tax reforms signed into law at the end of last year. "Everybody wins a little, everybody loses a little," said Rep. Janet Ancel (D-Calais), the House Ways and Means chair and member of the conference committee. 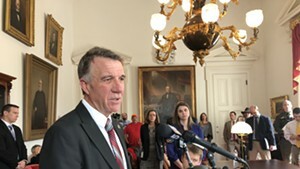 The bill would allow Vermont taxpayers to take a 5 percent tax credit for charitable deductions up to $20,000 and create a new exemption for Social Security benefits, which had been proposed by the governor. Recipients would get an exemption on the first $45,000 in income for single persons and the first $60,000 for married couples, and a lesser exemption for the next $10,000 in Social Security income. The bill would also create a standard deduction of $6,000 for single persons, $12,000 for married couples and $9,000 for heads of household. And it would establish a personal exemption of $4,150. Those measures are meant to compensate for the effects of federal tax reform. The bill would also create two special commissions. The first would be charged with a thorough examination of Vermont's entire tax system, with an eye toward efficiency, efficacy and modernization. It's essentially a repeat of 2011's Blue Ribbon Tax Structure Commission, whose recommendations were widely praised but generally unimplemented. The other commission would study staff-to-student ratios in public schools. This was taken, almost entirely, from Scott's school spending proposal. There is no commitment to raising ratios in order to save money, but the new panel will look for ways to trim staffing without affecting educational quality. The conference committee's version of H.911 will go before the full House and Senate on Saturday.